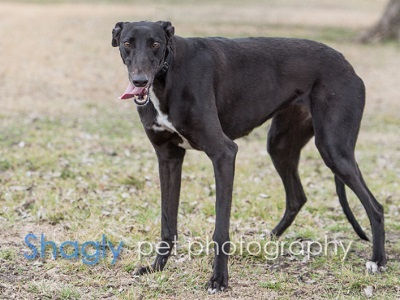 Sage is a 2 year old black female born in 2016. She was part of the population from the blood bank facility located in Cherokee, TX that closed in November 2017. Sage is being medically evaluated by GALT's veterinarians and will complete her medical procedures soon. It is not known at this time if she is small animal or cat tolerant. Please check back periodically for updates on Sage's journey to her forever home. 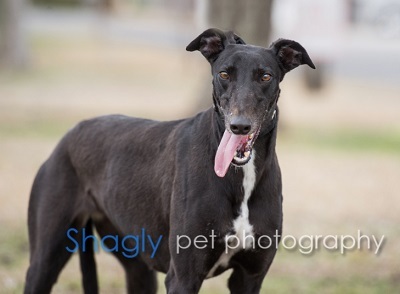 Sage is a sweet, petite 2 year old girl who hasn’t met a toy she doesn’t love! Her favorite thing is to either surround herself with every toy in the house or roach majestically in her crate. She’s got a little pointy fox nose that she loves to poke her alphas with and small petite feet that can really travel when she sees something in the backyard to chase. Beware squirrels, birds or bugs when Sage is outside. She skillfully makes herself very still and quiet to blend into the background, which she does easily as a black girl with just small dabs of white fur here and there. We’ve seen her stalk and also point to birds or squirrels from time to time! This girl loves her backyard so her forever family should have an outside area for her to roam around in and no small animals living in the house. When she’s not hunting or playing with toys, she’s flat on the floor by the front door with her tongue hanging out and pooling in a small heap underneath her snout. It’s hilarious! She’s got a fabulous personality and loves everyone who comes to visit. She would be happiest with at least one other dog and if more dogs, even better. Sage feels like she is an important part of the pack even though she’s on the lower status rung. She walks well on a thunder leash and is learning to walk with a regular leash now, too. Sage is an excellent eater and is never finicky. We still separate her from the others at mealtime because she has showed some signs of food protection. This girl has been a true delight to have around. Her youthful energy and loving spirit are contagious!